Rhys Hoskins' MLB debut and rookie season was one for the record books. Now you can commemorate his prodigious power display with this official Rhys Hoskins 2017 Rookie Season debut record bat! Hoskins set an MLB record by becoming the fastest player to hit 18 home runs to start a career - doing so in just 34 games. This bat comes engraved with his final rookie season stats and acknowledgment of his MLB record. 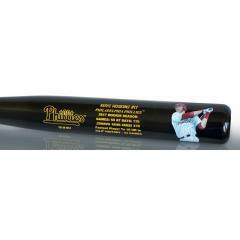 This officially licensed commemorative bat also features the reproduced work of noted artist Jolene Jessie. Each full size bat is individually numbered and will make an amazing addition to any Phillies fan's collection. Order your Limited Edition bat now before they are gone.